Arkansas slot machine casino gambling consists of two racinos offering skill-based slot machines alongside pari-mutuel wagering of horse and dog racing. These electronic games of skill are legally required to have a minimum payback return of 83%. Arkansas’ two pari-mutuel racetracks are on opposite sides of the state, in Hot Springs and West Memphis. The electronic games offered include slot machines requiring skill, video poker, and video blackjack. The table games offered at both racinos are Poker, Let It Ride, and Three Card Poker. These skill-based slots are allowed by state law, but only if approved by local municipalities. With this style of slot machine, players are provided two opportunities to spin the reels, where the player’s skill is required when determining which and how many of the multiple reels are to be re-spun. 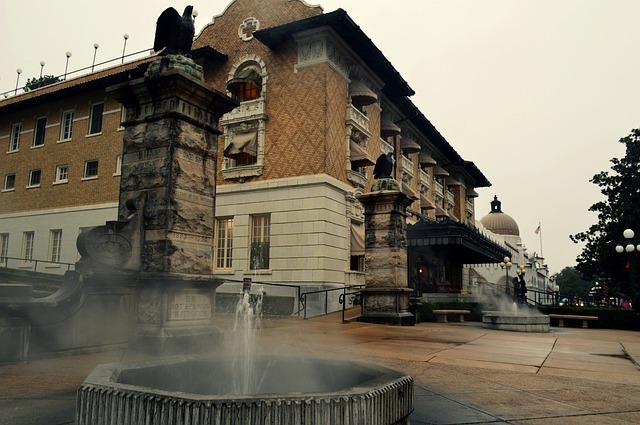 Hot Springs’ Bathhouses (Arkansas Slot Machine Casino Gambling 2018). The state legislation which permitted electronic gaming machines is called the Local Option Horse Racing and Greyhound Racing Electronic Games of Skill Act of 2005. Per this state law, all electronic games of skill are required to provide at least a minimum return of 83%. Arkansas State Capital Building (Arkansas Slot Machine Casino Gambling 2018). All slot machines are legal to privately own, with the usual restriction that they cannot be used for gambling without a gaming license. The state gaming commission is a section established within the Arkansas Department of Finance and Administration (DFA). Development of rules and standards for operation of expanded gaming. Employment of personnel to conduct the compliance and regulatory duties. Oversight as to the proper operation of gaming devices. Audit/review of established procedures for daily gaming operations. Review/calculation of proper state “privilege fee” as established by law. 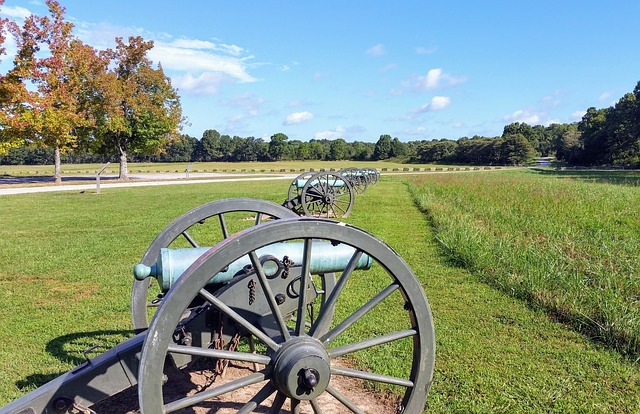 Row of Cannons at an Arkansas Civil War Monument (Arkansas Slot Machine Casino Gambling 2018). Arkansas’ two racinos have more than 2,651 skill slots and gaming machines. These two racinos are on opposite sides of the state from each other. Arkansas has no other types of casinos besides these two racinos offering either greyhound and horse racing alongside skill-based slot machines. However, a casino gambling amendment effort is underway in Arkansas, where signatures are being gathered to put it on the ballot in November of 2018. Interestingly enough, there are actually two casino gambling amendments competing to be placed on the ballot. Both proposals includes wagering on sporting events, which is currently prohibited by state legal statute. One proposed amendment is a repeat of an attempt by a Missouri group which failed to reach the ballot in 2016. At that time, it was supported by the Cherokee and Quapaw American Indian tribes of Oklahoma. However, these tribes are now backing the other casino gambling amendment proposal. This second proposed ballot supports the Southland and Oaklawn Parks racinos, while allowing greater competition for two additional casinos, one each in Jefferson and Pope counties. Both of Arkansas’ pari-mutuel wagering facilities with skill-based slot machines have a rich history going back over 100 years. Located in Hot Springs, 60 miles southwest of Little Rock, offering horse racing.Offers 1,290 gaming machines and greyhound dog racing while being open until 3 a.m. nightly and 4 a.m. on weekends.Average payout return from mid-2016 thru mid-2017 was 93.52%. Located in West Memphis, just across the Mississippi River from Memphis, Tennessee.Offers 1,900 gaming machines and horse racing while being open until 3 a.m. nightly and 4 a.m. on weekends.Average payout return from mid-2016 thru mid-2017 was 93.00%. Oaklawn Park is located in western Arkansas near the border to Oklahoma. On their website, Oaklawn Park provides an updated list of their most popular slot machine game themes. Southland Park is located on the eastern Arkansas border near Tennessee. There are no tribal casinos in Arkansas. 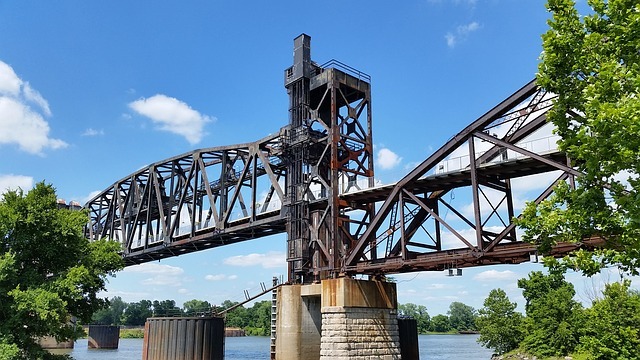 Railroad Lifted Bridge Crossing in Little Rock (Arkansas Slot Machine Casino Gambling 2018). There is no state lottery available in Arkansas, which is prohibited by state law. Sports and games betting are currently banned by state legal statute. Betting via card games can result in fines not less than $10 and not more than $25. Otherwise, Arkansas does legally allow charitable bingo and raffles. The gaming regulations for these charitable activities were made legal via the Charitable Bingo and Raffles Act of 2007. As an alternative to enjoying Arkansas slot machine casino gambling, consider exploring casino options in a nearby state. East: Mississippi Slots and Tennessee Slots. Each of the links above will take you to my state-specific slots blog for that bordering state to Arkansas. All electronic games of skill are legally required to provide at least a minimum return of 83%. No maximum payout return has been set. Publicly available payout returns for Arkansas casinos is limited to annual statistics for electronic gaming machines for each racino. For mid-2016 thru mid-2017, actual payback returns were 93.52% for Oaklawn Park and 93.00% for Southland Park. 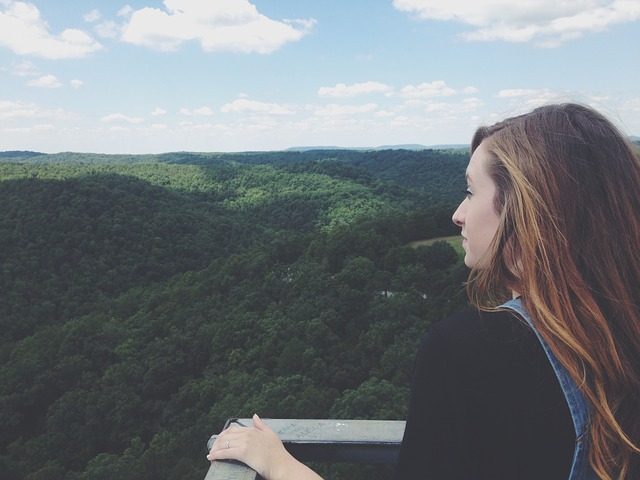 Overlooking View of the Arkansas National Forest (Arkansas Slot Machine Casino Gambling 2018). Arkansas slot machine casino gambling consists of two racinos offering pari-mutuel wagering of horse and dog racing alongside skill-based slot machines. These electronic games of skill are legally required to have a minimum payout return of 83%. Arkansas’ two pari-mutuel racetracks with skill-based slots are located on opposite sides of the state. Annual actual returns were 93.52% for Oaklawn Park and 93.00% for Southland Park. In the last year, the number of slot machines at Oaklawn Park increased from 1150 to 1290. At Southland Park, they increased from 1501 to over 1,900. Like most others, both casinos continue to switch out older and underperforming slot machines for newer and hopefully higher performing machines on a daily basis. These replacements include offering an overall greater portion of penny and progressive slots. 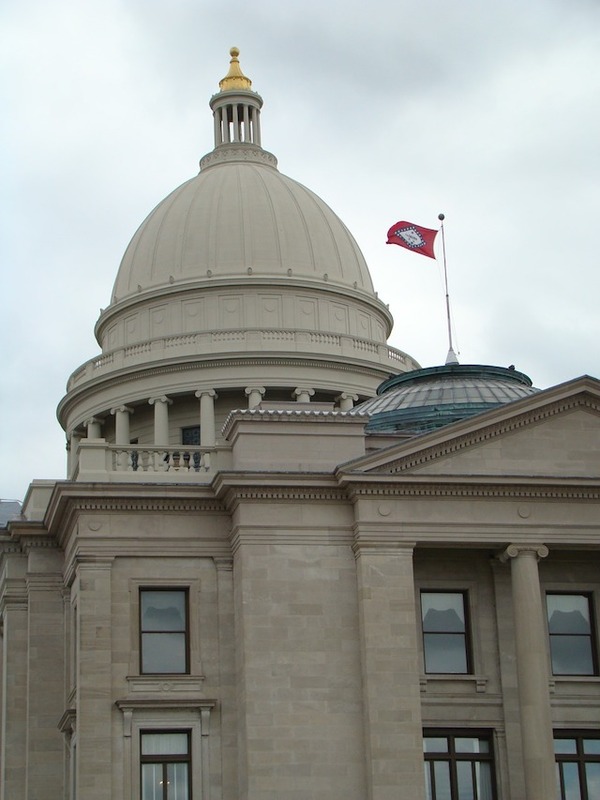 If either of the two proposed casino gambling amendments are placed on the November 2018 ballot, and subsequently approved by voters, substantial expanded gaming in Arkansas may well be seen over the next year. 2017 Archive: Arkansas Slot Machine Casino Gambling 2017 – For Arkansas slot machine casino gambling, casino establishments and devices are prohibited along with lotteries as well as sports and games betting. However, some forms of gambling are permitted, including limited table games, electronic games of skill, and pari-mutuel wagering of dog and horse races at two racinos. Previous: Arizona Slot Machine Casino Gambling 2018 – Arizona slot machine casino gambling consists of 25 tribal casinos operated by 21 federally-recognized tribes. These tribal casinos currently offer 15,390 slot machines, out of a legal limit of 18,158 machines. Payout returns are 80% and 100%, but actual return statistics are not legally required to be made publicly available. Next: California Slot Machine Casino Gambling 2018 – California slot machine casino gambling consists of 66 tribal casinos having Class II or Class III electronic gaming machines. The newest is Rain Rock Casino, having 349 slot machines. Tribal casinos in California are not required to release their slot machines payback percentages. No minimum payout return was established.